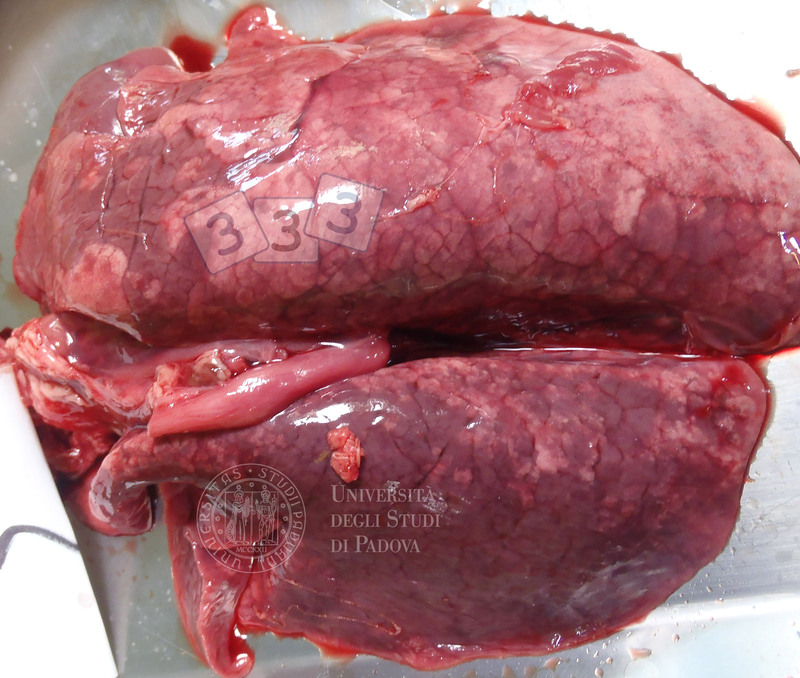 Lungs present a diffuse reddish discolouration and edematous appearance with "wet" feature, not collapsed when opening the thorax and with a "meaty" appearence of the cut surface. Interlobular interstitial spaces are enlarged. Scant pleural fibrinous effusion can be seen on right organ surface. Morphological diagnosis could be consistant with acute intersitial pneumonia related to viral infection as well as with acute pulmonary edema due to several circulatory and/or nutritional changes. This pigs comes from a small farrow-to-finish herd (150 sows) where no vaccination program against PRRSV and PCV2 were implemented. Both pathogens were diagnosed, during a mild respiratory outbreak in pigs of about 9 to 12 weeks.